Finally the Copa Del Rey springs to life with teams from first division losing more than expected. Real Madrid joined the latest list of casualities with a 3-2 defeat at the hands of Real Union. FC Barcelona struggled to a 1-0 victory against Benidorm; Villareal were thrashed handsomely by Poli Ejido and Sevilla lose to Ponferradina; what more you can ask to make the first leg interesting. Most of these teams have fielded their second string teams; but their second string side would be too powerful for these minows. Just before the start of this season's Copa Del Rey, there were questions about the format. And when you consider an already over crowded football fixture, it was natural to have a cry for abandoning this from the big club fans. But the early results have thrown out that request and brought back the excitement back to the Copa Del Rey. Now Madrid and Sevilla has to win at home to progress; whereas Villareal have to play out of their skin to do the same. What makes the Copa Del Rey and the FA cup so interesting is the fact that it gives the smaller clubs a equal footing. Especially in the FA cup format gives more chance for smaller clubs against bigger counter-parts. If Copa Del Rey format was similiar to the FA cup format; Madrid, Villareal and Sevilla would have already knocked-out. For the smaller clubs every match is like a title match, they have nothing to lose but a world to win. Every match is their new shot at glory. But what is applaing towards Copa Del Rey is the apparent lack of interest shown by Spanish Federation. How can you otherwise explain the fact that one of Poli Ejido's biggest victories went unwatched by the majority of soccer fans. The TV coverage for Copa Del Rey is appaling; it is more surprising when taken into consideration the fact that Spanish minnows always have performed better than their English counterparts. FIFA yesterday announced the list of probables for this year's 'World Player of The Year'. The good thing for all Soccer and Barca fans is that - Iniesta has made it into the list. The other FC Barcelona players who made into the list are Xavi Hernandez, Lionel Messi and Samuel Eto. Surprisingly Puyol goes missing from the list. The full is is - Emmanuel Adebayor (Togo), Sergio Agüero (Argentina), Andrei Arshavin (Russia), Michael Ballack (Germany), Gianluigi Buffon (Italy), Iker Casillas (Spain), Deco (Portugal), Didier Drogba (Côte d'Ivoire), Samuel Eto'o (Cameroon), Cesc Fabregas (Spain), Steven Gerrard (England), Zlatan Ibrahimovic (Sweden), Andrés Iniesta (Spain), Kaká (Brazil), Frank Lampard (England), Lionel Messi (Argentina), Franck Ribéry (France), Cristiano Ronaldo (Portugal), John Terry (England), Fernando Torres (Spain), Ruud van Nistelrooy (Netherlands), David Villa (Spain) and Xavi (Spain). I have to admit that it is a great pleasure to see two top class Goal Keepers making into the list. Ex-Barcelona player Deco also have made into the list only on the basis of a good Euro 2008 display. Andrei Arshavin who has been linked to FC Barcelona during the summer and Cesc Fabregas who has been rumoured to re-join Barca at the earliest also make into the list. The presence of Kaka who missed the majority of last season and Deco who had a pathetic season with FC Barcelona would raise some eyebrows. Otherwise the list looks more perfect than Ballon D'or list. The main contenders for the title this season would be Christiano Ronaldo and Iker Casillas. FIFA always give preference to the player's achievement with the country especially in a tournament year is no secret. This could tilt the poll in favour of Casillas. Xavi who had an excellent Euro 2008 is also a main contender; but a lack of success with FC Barcelona could harm his chances when compared to Iker or Christiano. Valdes - 7 - Had nothing much to do for most part of the match. In the 28th and last minute of thematch he pulled off two good save to keep a deserving clean sheet. 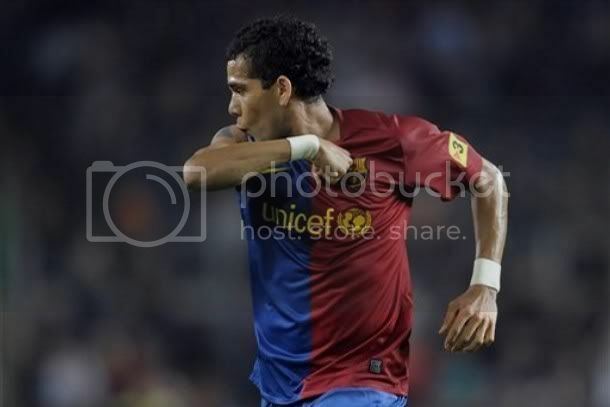 Alves - 8 - He himself have said that it took some time for him to settle in the team. Today's performance was a testimony to the fact that he has already settled in the team. Did well as usual while going forward; in contrast to other matches did equally well while defending. Capped a great performance with a goal. Marquez - 7 - Like Valdes had nothing much to do. Failed to deal with a ball in the 28th minute, luckily for him Valdes saved him. Apart from that blemish controlled the defnse well. Puyol - 7.5 - Like his conter-part had nothing to do. Occasionally went forward and now there is a confidence in him while going forward. Marshalled his boys well. Abidal - 8 - Terrific match for this french national. Two match before he looked like a disaster in waiting; but now he is showing the glimpses of why he was so highly rated and brought by Rijkaard. Wone almost all his challenges and was great to see him covering his centre-backs with ease. Xavi - 8 - General of midfield. This has become a habit for him to churn out great performance. Unselfishly squared the ball to eto for the third goal. Toure - 8.5 - Great game for this Ivory Coast palyer. Is returning to his last season form. Created the first goal with a great pass. Won almost all the challenges. He is indeed the assurance Messi, Iniesta and co requires while going forward. Iniesta - 9 - What a match for this gentleman. When it looked like he is well settled in the front left role he churns out another terrific performance in middle. Guardiola would be worried now to decide where to use him. Was involved in all the FC Barcelona move. Which fool prepared the Ballon D'Or nomination list? Messi - 8 - Great match again for this Argentinian wonder kid. He may not have been at his best today, but a half good Messi is enough to create two goals. Eto - 8.5 - Almost all his goals were easy tappin after others have done the hard work. But to his credit he cooly converted all of them. Great presence infornt of the goal. Henry - 7 - Wasn't that great. But showed that he can complement his other team mates. Even if Iniesta drops to midfield I have genuine doubt whether he will keep the postion especiall with Hleb trying so hard. Hleb, Bojan and Sanchez - 6.5 - The game has cooled off befor they came. only Hleb did make some small impact. FC Barcelona continued their winning streak to nine matches in all competitions and Valdes extended the clean sheet record for the third match in a row. Almeria would have been thankful to FC Barcelona players to take the foot off the pedal in the second half, otherwise it would have been resulted in their worst defeat in the league. Ironically their worst defeat came against the same opponenents. FC Barcelona scored five goals past the Almerian defense within 36 minutes of the game and that would have send shrivers through Europe. FC Barcelona would be the first team in everyones mind now to avoid in the knowckout stage of Champions League. The Almerian defense didn't do any big mistake; but FC barcelona boys tore them apart in one of the most enjoyed first half of this season. Guardiola decided to drop Iniesta to midfield and that mean the trio of Messi, Eto and Henry formed the forwards. Iniesta joined hands with Xavi and Toure in the midfield. Alves, Abidal, Puyol and Marquez formed the defense ahead of Valdes. This is an indication of the best FC Barcelona line-up for the rest of season. The game started in frantic pace. Almeria's Crosat headed wide in the 2nd minute to set up the pace of the game. In the 4th minute Xavi's shot was saved by Goal keeper Alves. 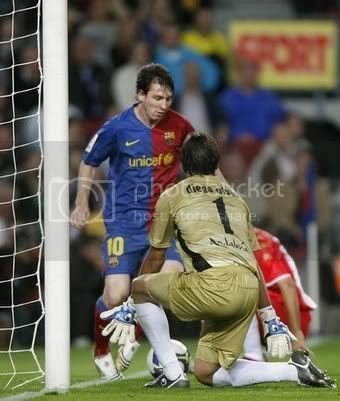 But from the resulting corner Eto put Barca one up. Messi too k the corner which indeed was a poor one and ended with Toure outside the box. Toure produced a master ball towards spotting an excellent run from Iniesta, frantic defending saw the ball been headed but staright to the path of Eto who finished it with ease. In the 10th minute Alves who was working tirelessly send a cross from the left wing to find Henry, but defense cleared in time. 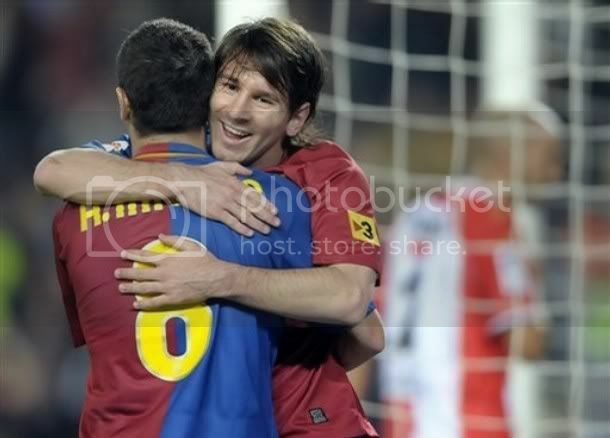 Then in the 13th minute Henry got into the scoresheet with a wonderful assist from Messi. Messi played a great ball to Iniesta whose run took him into a very tight angle; Iniesta played the ball back to the centre but towards defense; but they cleared it on to the path of Messi who crossed it to Henry who was at the far post and had the simplest of tapping to do. In the 16th minute Messi sets up on his trade mark run dribbling past defenders but his shot went wide of far post. In the 18th minute Barca was almost caught out when Alves has to clear out the danger with a header. In the 19th minute it was Eto's shot to test the Goal keeper again but he shot at straight at Alves after the defense cleared the ball staright to him. 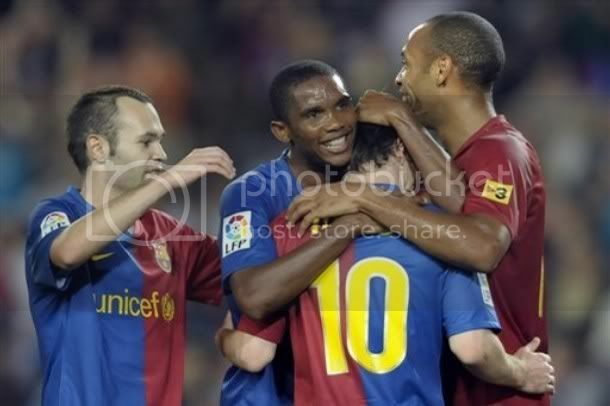 Then in the 21st minute FC barcelona made the scoreline 3-0 with Eto's second goal of the night. Iniestafound Xavi's run with a great through pass; Xavi unselfishly squares it to Eto who had another simple tapping. In the 24th minute Eto compleetd his hat-trick with another simple tapping after Messi had done all the hard work. Messi dribbled in to the box from the left and used the dfenders body well to get past him; he the squared the ball to Eto who finished off with a good back heel. In the 28th minute Victor Valdes pulled of a great save to deny Crosat. In the 30th minute Negredo was send off after a rash challenge on Marquez. Down to ten men it was always tough for Almeria to defend and Alves made it more pathetic with a goal scored of the free kick in the 37th minute from 30 yards out. In the second half FC Barcelona took the pedal completely off the foot but made sure that they dominated the possesion. 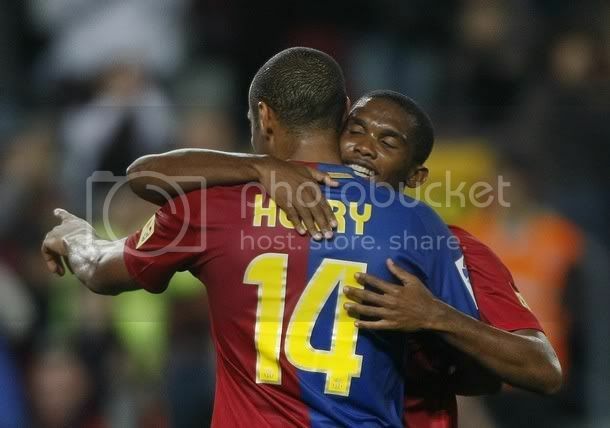 In the 50th minute Henry made space for himself with a great touch from a Abidal pass but shot high. He did all the tough work there with simple ease. Guardiola tried to bring back the pace with bringing Hleb in for toure, Bojan in for Henry and Victor Sanchez in for Alves. But nothing seemed to have worked and the players seemed to have cooled off. In the 86th minute Eto was denied by the Goal Keeper from a great cross from Puyol. In the 90th minute Valdes had to make a goo save from mane's effort to make sure that he retains the clean sheet. Whatever FC barcelona played like champions in the first half and you cannot blame them for taking the foot off the pedal in the second half. Henry would have been one person who would have been greatly impressed by Iniesta's performance in the middle. Toure was majestic throughout the match, so did Abidal. Pep Guardiola has refused to name the final squad against Almeria till the time of match. So there will be real excitement this time about who is going to miss from the squad. The guaranteed absentees are Keita, Pedro, Milito and Gudjonsen, who all are out injured. Whatever Barca fans would be expecting their team to extend their winning streak to nine match in all competitions. Last season FC Barcelona saw off the Almeria challenge with goals from Messi and Henry. Almeria has been the surprise package of last season, and they are making sure that they are not called a one season wonder. It is essential for FC Barcelona to hit top form before they take on Sevilla, Valencia, Real Madrid and Villarreal one after other. We can expect Eto and Iniesta to make a come back to the side after being rested in the match against Basel. Eto, Iniesta and Messi should form the attacking trio. 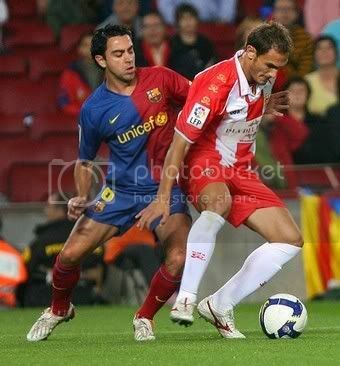 Xavi should lead the midfield along with Toure. The third person in that midfield will be tricky; Almeria will be definitely tougher than Basel and you need a atatck minded player there. Either Iniesta can drop to the middle or Victor Sanchez has to take the responsibility. I am not in favour of putting Busquests and Toure in the midfield together. The back four should see Abidal returning along with Pique to form the defense with Puyol and Alves. Anyway Victor Valdes is the only certainity under Guardiola. FC Barcelona fans might be expecting a goal rout from their players. I have a feeling that they may not be dissappointed. Valdes - 6 - Contrast to the weekend, Valdes was more tentative. He was struggling to collect regular crosses. The toothless Basel attack was the main reason he was able to keep a clean sheet. Alves - 8 - Best game of his season. Was trmendous going forward. Penetrated the defense with a great no-look pass to messi which resulted in the first goal. Was instrumental throughout the match. Marquez -7 - After a series of poor performance we saw the real Marquez today. Didn't have too much to do but was solid especially in front of a tentative Goal Keeper. Puyol - 7.5 - Like Marquez had nothing much to do throughout the match. marshalled his boys tremendously. Sylvinho - 6.5 - Was great when going forward. Appeared to have caught once or twice in defense. Showed great presence on the pitch especially considering the lack of match practice. Xavi - 8.5- Performed like a true Gladiator. Was slotted as the only creative head in the midfield. Was tremendous. Scored one goal created one for Busquests and was involved in every move. Toure - 8 - Because of the number of goals scored nobody noticed his performance. Gave a majestic performance. Won 95% of his tackles. Played the role of DM to near perfection. Guardiola would have to think twice now to overlook him for DM role. Busquests - 7.5 - Great performance. Scored one goal and created one for Bojan. May not have won all the tackles but is improving by leaps and bounds. Answered his critics who claimed that he is toothless when going forward. Messi - 9 - Was all over the pitch in the right sense. Cool finish for the first goal and was involved in every move. May have been a bit selfish at times but if he is in this kind of form we all can live with that. Bojan - 8 - Great performnace. Scored twice but issed atleast three good chance. But that's ok. He would feel great with the start and the goals. Hleb - 7.5 - Did well to stay in the match. At times the lack of match practice showed. But was good on the left side. Will have a tough time to keep that spot ahead of Iniesta. Henry - 6.5 - Missed a great header. Overall was good and came at a time when Barcelona was cooling off. Caceres and Victor Sanchez - 6 - Decent performance. FC Barcelona extended their winning streak with a comprehensive five goal victory against Champions League minows FC Basel. Victor Valdes should be pleased to be successful in keeping a clean sheet for the second game in succession. Actually, if anyone have threatened to deny a clean sheet it was Valdes himself. Guardiola surprised everyone with his team selection. Hleb, Bojan and Messi started as the attacking trio. The midfield was made up of Xavi, Busquests and Toure and the back four saw Marquez and Sylvinho coming in to pair with Alves and Puyol. Lionel Messi who was rested in the last match was active throughout and is looking like to spearhead the Barca challenge this season. FC Barcelona took charge of the game early in the first half. In the 4th minute Alves produce a great no-look pass to find Messi, who had the easiest of tapping to take Barca 1-0 ahead. The move was started with Messi giving the ball to Alves and timed his run; but the defense was surprised by Alves who looked the other way when he produce the cross. That was a Ronaldinho trade-mark pass. That early goal made sure that Basel could only do the catch up game for the rest of the game. In the 8th minute Bojan put the ball in the back of net but was rightly adjudged offsied. Then in the 15th minute Busquests scored his first Champions League goal when he latched on to an excellent cross from Xavi. In the 18th minute Basel Goal Keeper Costanzo denied Xavi from scoring off a Alexander Hleb corner at the near post. FC Barcelona by now was raiding FC Basel goal at alarming intervals. In the 20th minute Messi shoot wide after a good one-two with Bojan. Then in the 22nd minute Bojan made the scoreline 3-0 with an excellent finish from outside the box. Bojan received the ball and moved to his right to make some space and fires the ball perfectly to the far right corner of the goal. In the 30th minute Alves tremendous shot was blocked by Costanzo; Messi started the ball by spreading the ball to Hleb in the far left of the pitch, Messi then moved to the middle and plays a wonderful one-two with Hleb; Hleb passed the ball to Bojan whose effort was saved by defense but the rebound was placed in Alves's path by Busquests. In the 34th minute Bojna missed the most simplest of chance when he shot wide of an open goal after a header from the Xavi corner was saved. FC Barcelona should have had a penalty a minute before after a move which resulted in the corner. In the 37th minute Hleb's shot was saved by Costanzo; there was no power on that ball but the placement was good. In the second half everyone expected FC Barcelona to cool off a bit. But Barca players had another plans. In the 46th minute Bojan made the scoreline 4-0 from a counter-attack; Busquests put Bojan ahead of the defense with an inch-perfect pass. Two minutes later Xavi made it 5-0; Messi laid the ball to Xavi between defenders leg just outside the box; Xavi placed the ball perfectly to the far corner to cap a remarkable performance. In the 52nd minute Marquez was taken off and was replaced by caceres. Barcelona should have scored another in the 55th minute when Bojan chipped high after rounding off defenders and Goal Keeper. In the 56th minute Guardiola replaced Xavi with Henry. In the 60th minute a rare atatck from Basel had to be cleared by defense. In the 63rd minute Basel again threatened the Barca defense but they were outdone by the lack of own players in Barca goal. Towards the ned Henry midded a decent chance and Valdes had to make a good save to keep the clean sheet. Overall the performance was good. But FC Barcelona was helped by the fact that Basel's defense was practically non-existent throughout the match. Valdes did make some usual misses but none was costly. 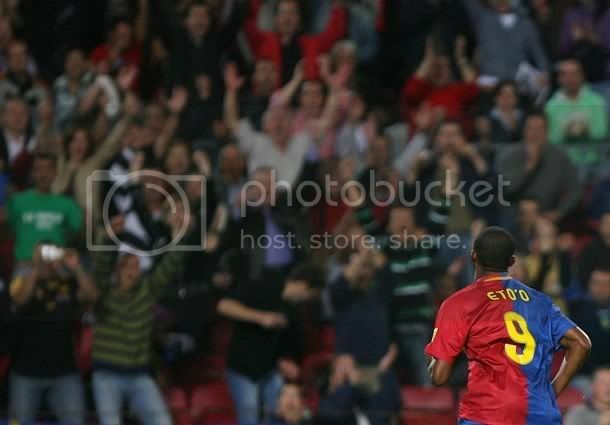 FC Basel were no match to FC Barcelona; that gave Guardiola the confidence to replace Xavi with henry in the match. FC Basel would be in for real tough time at Camp Nou in two weeks time. FC Barcelona resume their Champions League quest against FC Basel away from Home. FC Basel lies at the bottom of Group C and this would be the perfect oppurtunity for Barca to take a giant step towards qualification. Barca fans would be hoping that their players would be able to round off the match much earlier than like the Shaktar match. Guardiola will be missing the service of Keita as he has been confirmed to be out of the game for two weeks. But this should not worry Guardiola as Xavi and Caqceres returns into the squad.Gudjonsen and Pedro both are continuing their recovery program along with Milito and is missing from the squad. The squad picked by Guardiola for FC Basel match is Valdés, Pinto, Alves, Víctor Sánchez, Puyol, Márquez, Martín Cáceres, Piqué, Abidal, Sylvinho, Busquets, Touré, Iniesta, Xavi, Bojan, Hleb, Henry, Eto'o and Messi. Messi, Eto and Iniesta is expected to rejoin for the match. The midfield could threw up some surprise. Xavi is the only certainity there. With the absence of Keita and Gudjonsen, Victor Sanchez stands a good chance to making his Champions League debut. Toure or Busquests would play the holding midfielder role; may be Busquests would be preferred as Toure is carrying a knock from last match. Another possibility would be Iniesta dropping back to the middle with henry taking up the front left position; in that case Victor Sanchez is definitely going to miss out on a start. The back four ideally would be made up of Abidal, Alves, Puyol and Pique. Do Messi deserve the Ballon d'Or?